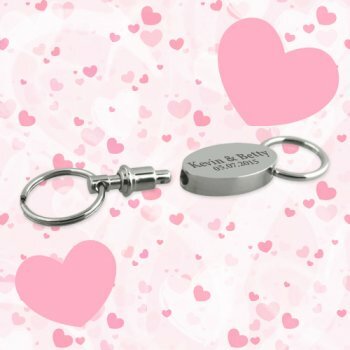 You can forge close proximity with your customers through these promotional elliptical pull apart metal keychains because they can never ignore it for anything else. Featuring a polished metal pull apart key chain, which gives enough space for you imprint your brand logo, prior to gifting. You can get your brand logo laser engraved on one side for better visibility. Attractive price savings can be availed on bulk orders of this metal keychain along with freebies such as free online design proof and free shipping. Request a quote to know bulk order discounts for these customized elliptical pull apart metal keychains.